The poem was first published in 1983. The poet was a class-III employee of the Bombay Dockyard, Vasant Dattatraya Gujar, now in his 70s. More than two decades later, Tuljapulkar’s case has wound its way to the Supreme Court a unique question the apex court has posed: Under Indian laws, does one have the ‘poetic licence’ to use the name of historical personalities such as Mahatma Gandhi as a symbol in his/her poem, which a reader might find obscene? The poem has been published several times, before and after Tuljapulkar printed it. 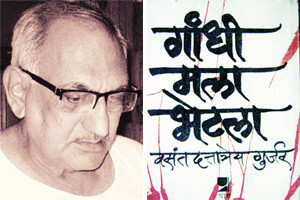 It has been appreciated by several Marathi, as well as Hindi poets and authors. It is to be included in an anthology to be published by the Sahitya Academy, put together by the 2014 Gyanpeeth award winner, Bhalchandra Nemade, as one of the best literary works on Gandhi.However, when Tuljapulkar republished the poem in 1994, Patit Pawan Sangathana, a Pune-based right-wing Hindu organisation affiliated to the Rashtriya Swayamsevak Sangh, filed an FIR against the four, claiming it was obscene and lowered the image of the Father of the Nation. Tuljapulkar was a leader of the Communist Party of India-controlled All India Bank Employees Association. In Latur district, the police filed a case against the four, under sections 153A, 153B and 292(3) of the Indian Penal Code. Section 153A is imposed against those promoting enmity between different groups on grounds of religion, race, place of birth, residence, language. Section 153B is imposed for imputations and assertions prejudicial to national-integration. Section 292(3) is imposed when something is found obscene or lascivious, appeals to the prurient interest or tends to deprave and corrupt someone. The SC says historically respectable figures command a different threshold of obscenity. Then, without explaining what that threshold is, it says that the question is whether “in the name of artistic freedom… a poet… may be obscene.” Yet there is absolutely no quarrel with that proposition! Everyone accepts that obscenity is a constitutional restriction upon the freedom of speech in India. The question is what constitutes obscenity. Truth is not separate from Beauty. Truth is Beauty. I see Beauty by way of Truth. Truth, it is harder than stone, but much more tender than a flower. Gandhi met me on Akashwani Mumbai’s 537.6 kilocycles (frequency) in his Gandhivandana programme. He said: Even the Mahatma’s word should be examined on the scale of intellect and if he fails, his word must be abandoned. When Gandhi met me at a Buddhist monastery, he was eating beef chilli. When Gandhi met me at a church, he knelt in front of the Christ, who forgives every week. “The welfare of Harijans is my survival instinct. I don’t want rebirth but if I am reborn, I wish to be untouchable to experience sorrow, suffering, and insults. Saying this, he bathed in the temple of goddess India and stepped into the Ganga. Gandhi met me at Sane Guruji’s AntarBharati schools where he was narrating Shyam’s sweet stories to the helpless kids, who exploited their mothers and hailed their abusive fathers. Shyam’s mother (Shyam Chi Aai) told him to use a Nirodh without fail. I saw Gandhi masturbating in the memory of Hema Malini on a public street. This was the country’s first street play. Arms are not to be outstretched to beg. The donation makes one vulnerable and saying so he accepted a cheque in American dollars. As he passed his time watching a movie titled Workers of the world, unite! He was leaving the farms for city life. Gandhi met me in Black Gandhi’s clinic selling Savarkar a sample bottle. Gandhi met me during Atal Behari Vajpayee‘s rule chanting praises of Gandhian Socialism. India is calling for RED on Red fort. Gandhi met me in the Kremlin accepting a Nobel Peace Prize from Brezhnev. Gandhi was consoling Reagan by showing him the fixed and movable assets that the world of dead humans possessed. What treatment will you offer? What experiment will you perform? What light will you shed? I am Hindu and I am proud of it. I will teach students at convent schools and help them migrate to England and America. What is the definition of a secular country? Wonderful poem! Satire flows uninterruptedly..